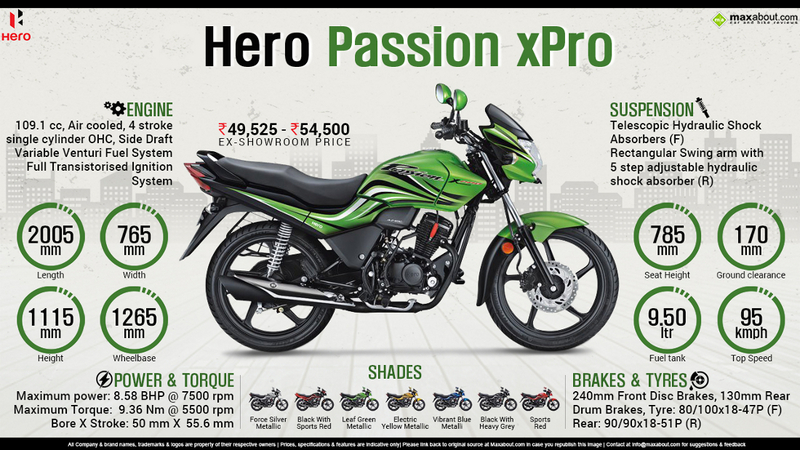 Hero Passion Pro or Passion xPro or any other bike? Hero Passion xPro is a better option when considering a motorcycle with balanced pickup and mileage. The xPro uses a 109 cc engine producing 8.58 BHP @ 7500 rpm and 9.36 Nm @ 5500 rpm whereas the Passion Pro uses a smaller 97.2 cc engine. The real world mileage would not vary much whereas the xPro comes with a better design and shade availability. The suspension on both the bikes are same and pillion seat comfort is quite good in both of them. Passion xPro comes with a price range of INR 49,525-54,500.